Such a great Idea from Real Simple Magazine back in October 2004! 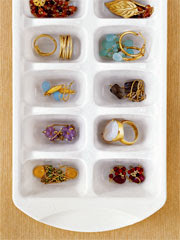 Storing jewelry in Ice Cube Trays in your drawer! What an easy way to keep your jewelry organized and untangled! They would look even prettier if I could fill mine with all your jewels! I do the same thing with my rings, bracelets, and earings! It works really well.